Left: Muslims pray at the Kaaba in Mecca. Right: Jews praying at the Wailing Wall in Jerusalem. Both pleading to the God of Abraham. 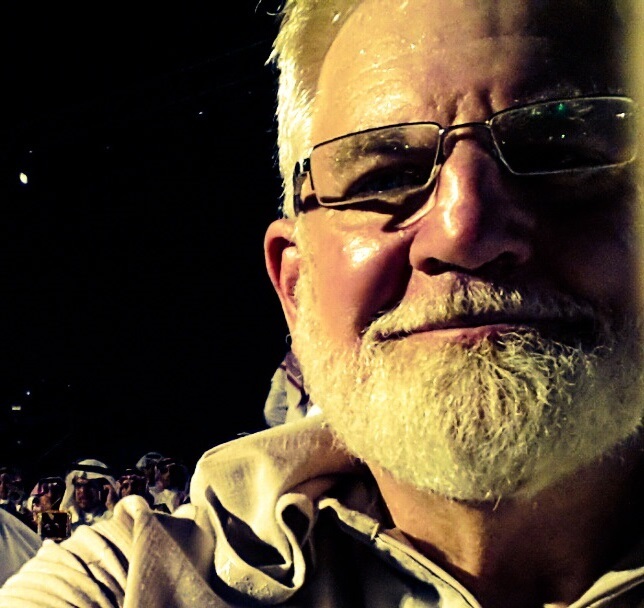 Last night I was invited by three Muslim friends to join them in the holy city of Mecca. I took this photo (above left) of my Muslim brothers praying at the Kaaba (a worship place built by Prophet Abraham). It reminded me of another photo (above right) I had seen of Jews praying at the Wailing Wall in Jerusalem (the foundation stones of the worship place built by Prophet Solomon). These stone buildings are not objects of worship. They are merely places to focus one’s attention on the one and only God of the universe. We must remind ourselves that both Jews and Arabs are genetically descendant from Prophet Abraham. They are “cousins.” They both pray to Abraham’s God. As I joined hundreds of men and women in making the ritual tawaf (the prayerful circumambulation of the holy Kaaba), Scriptures came to mind reminding me that disagreements, no matter how difficult, must never lead to hatred. Hatred has no place in true faith. The context of Jesus’ prayer in the Gospel of Matthew, known to Christians as “the Lord’s Prayer,” outlines a heartfelt appeal to all of us (men and women) who make a public show of prayer. We are in essence told to humble ourselves in our relationships with others; seeking not to offend but rather to make amends. There are a number of award-winning films that have been released during the past few years that help one to understand what’s behind the conflict between Israel and Palestine–the heart of the Middle East crisis. Below you will see the closing scene from a great film Language of the Enemy (2008) about the Israeli occupation of Palestine and its resulting calamity. In the film an American Jewish university student falls in love with a Muslim Palestinian doctor. The young man is tragically killed by Israeli soldiers. This scene depicts the heart-rending despair separating Jews and Arab Muslims. It ends with an agonizing cry “Abraham!” If you haven’t seen this movie, get a copy and watch it. I also highly recommend the award-winning films The Gatekeepers, Five Broken Cameras and the recently released Omar. 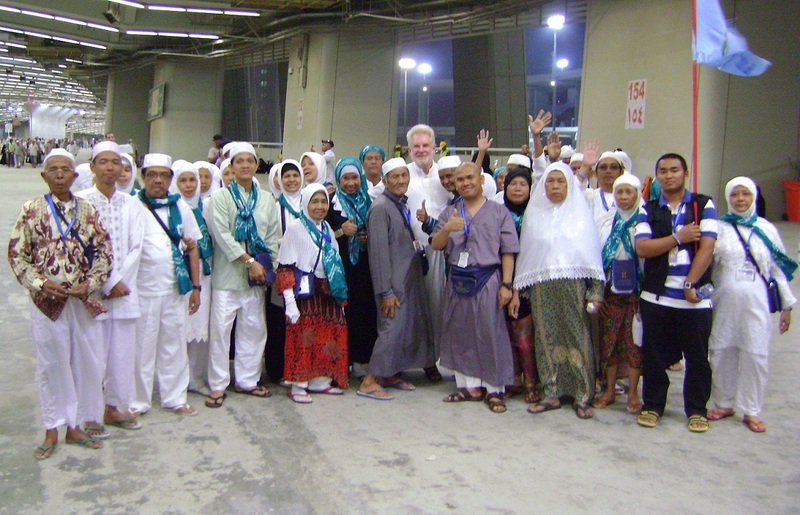 Sam and friends on the 2012 Hajj! Abdulrahman, Abdul Rudy and Sam, dressed in Ihram, begin the rigors of the annual Hajj in Mecca, Arafat, Mina and Muzdalifa. The three of us left Jeddah Wednesday morning, October 24, dressed in traditional two-piece terricloth wraps called Ihram, heading for the holy City of Mecca. By faith, a Muslim who completes the Hajj is believed to be cleansed from all sins committed during his/her life—to be reborn as a newborn baby. Abraham left them with only a limited supply of food and water, trusting God to care for them. However, after a few days Hagar and the child found themselves suffering from hunger and dehydration. In desperation, Hagar ran up and down two hills called Safa and Marwa trying to see if she could spot any help in the distance. Finally, returning to the child, she collapsed beside Ishmael and cried out to God for deliverance. Ishmael kicked his foot on the ground, and miraculously a spring of water began to gush up from the earth. Hagar and Ishmael were saved. Now that they had a secure water supply, they were able to trade water with passing nomads from the Well of Zam Zam in exchange for food and supplies. 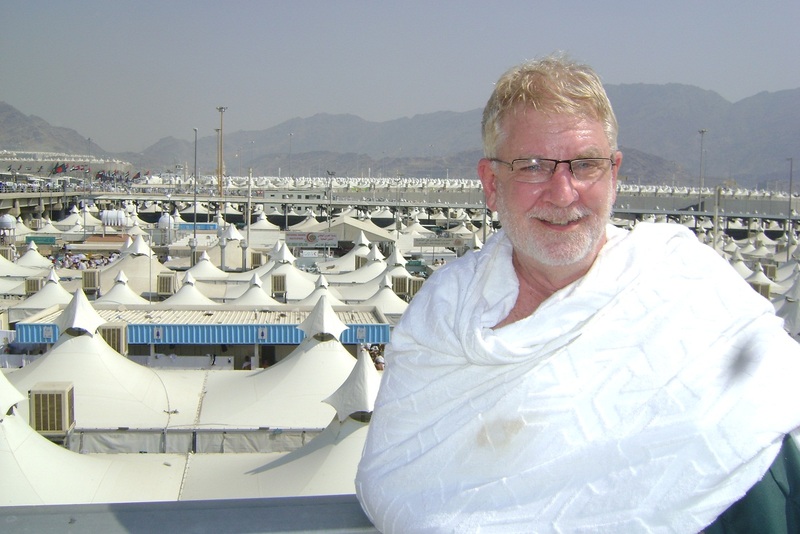 Sam gets a look at the miles and miles of Hajj campsites in the Mina Valley. It’s all managed through a high-tech central command center operated by the Hajj Commission of Saudi Arabia. We’re told, that after some time Abraham returned from Palestine to check on his family and was astonished to see them managing a profitable well. The Prophet Abraham was told by God to build a shrine next to the well. Abraham and Ishmael constructed a small stone structure–the Kaaba (or Cube). It was to become the gathering place for all who wished to strengthen their faith in the one true God. As the years passed, it’s said that Ishmael was blessed with prophethood, and he preached to the desert nomads a message calling upon them to surrender or submit to God. After many centuries, Mecca, thanks to its continuing, reliable water supply, became a thriving city. But gradually, the people left their faith in the God and turned to polytheism and idolatry, worshipping many different gods of stone and wood. The shrine that had been built by Abraham and Ishmael became a house of pagan idols. After many years, the Archangel Gabriel revealed the Qur’an to the Prophet Muhammed and told him that he should restore the Kaaba to the worship of the one true God of Abraham. In the year 628 Prophet Muhammed set out on a journey with 1400 of his followers. This journey was the first Hajj pilgrimage in Islam, and would re-establish the faith of their patriarch Abraham. Today the Hajj commemorates both Abraham’s and Muhammed’s struggle against polytheism and paganism. More than 3 million Muslims gathered from around the world in the desert cities surrounding Mecca for the 2012 spiritual, but incredibly difficult, Hajj. Many pilgrims fly to Jeddah, and then travel to Mecca by bus. Some of the wealthy are on packaged tours costing over $4,000. The poorer Muslims have saved all their lives just to pay for airfare. They manage to sleep either in modest tent camps or lay on cardboard or rugs along the streets of Mina. Then pilgrims proceed to the famous Al Haram Mosque in Mecca, walking counter-clockwise around the Kaaba, where certain ritual prayers are said during and afterwards, offering praise to God. Next the pilgrim goes to the walkway between the hills of Safa and Marwa, following the same trail as Hagar when she searched for help. The pilgrim walks back and forth, just as Hagar, seven times. These hills are now enshrined within the Mosque. The pilgrim has now completed the Umrah and declares through prayer his/her intention to do the Hajj, before travelling (by bus or foot) some 20 kilometers to the Mena Valley, where one remains in prayer until the next morning. To carry out the pilgrimage rituals, one needs to be in a special state of ritual purity called Ihram. One does this by bathing, making a statement of intention o God, by wearing the Ihram and by following certain strict guidelines. The terricloth Ihram has two purposes. (1) It is symbolic of spiritual purity. (2) It demonstrates that all Muslims are equal–there is no class consciousness. 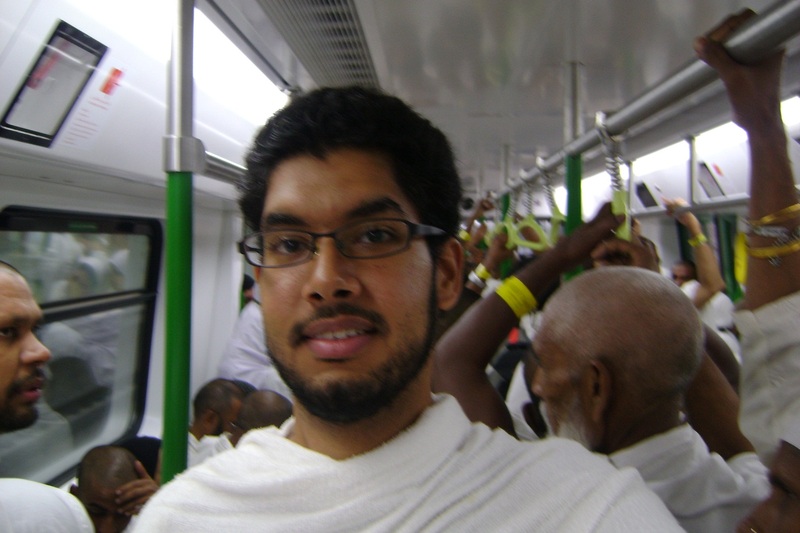 Abdulrahman on board the Hajj train bound for Arafat at the far end of the Mina Valley. Then there is the long trip as millions of men, women and children make their way back some 8 miles to Mecca (many on foot). Upon arriving once again at the Al Haram Mosque one again performs the Tawaf, the seven rounds of the Kaaba. After this, men’s heads are shaved as a symbol of humility and obedience to God. Women remove a lock of their hair. Pilgrims then return once again to his/her hotel or campsite for three to four days and the two additional visits to Jamarat in Muzdalifa, casting 21 stones each time. Finally, one does a farewell Tawaf in Masjid-al Haram in Mecca, asks God’s forgiveness, and the Hajj is finished. Many foreign guests proceed by bus to the Prophet’s Mosque, six hours north in the holy city of Medina, but this is optional. A modern, high-speed train system between Mecca and Medina is now under construction. 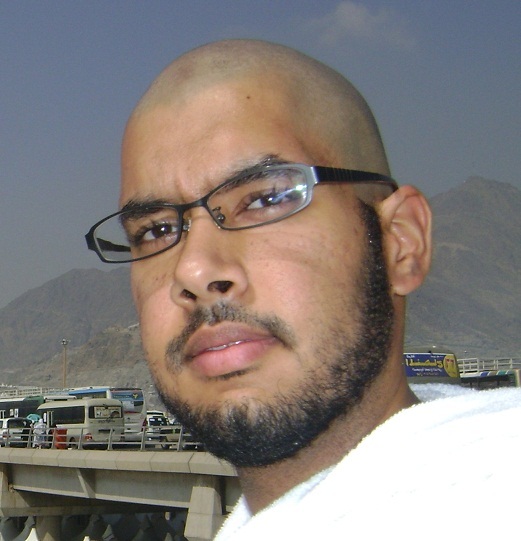 Abdulrahman had his head shaved as did the Prophet Mohammad at the end of the very first Hajj. A man who has completed the Hajj is called a Hajji, a woman who has completed it is called a Hajjah. As followers of Prophet Muhammad’s tradition, all Muslims who perform Hajj, reinforce their belief in his teachings and follow his traditions which in the Muslim world are known as Sunnah. At the end of the Hajj, Muslims from all over the world celebrate the holiday known as the Eid ul Adha (Festival of the Sacrifice). Many offer the sacrifice called a Qurbani. A lamb or sheep is slaughtered, and the baked meat is distributed to the poor. This is usually done by a local butcher under strict halal regulations, very similar to the kosher rituals of Judaism. This festival commemorates the obedience of Abraham when he was ordered to sacrifice his precious son Ishmael. While this might sound unloving—I mean what kind of God would demand such a sacrifice?! It was really a test of Abraham’s faith. The Saudi Arabian Ministry of Hajj, has been forced to institute a system of registrations and travel visas to control the annual flow of the millions of pilgrims. This system is designed to encourage and accommodate first-time visitors to Mecca, while imposing restrictions upon those who embark upon the trip multiple times. More than 3 million men, women and children from around the world made the pilgrimage to Mecca and Arafat this year. 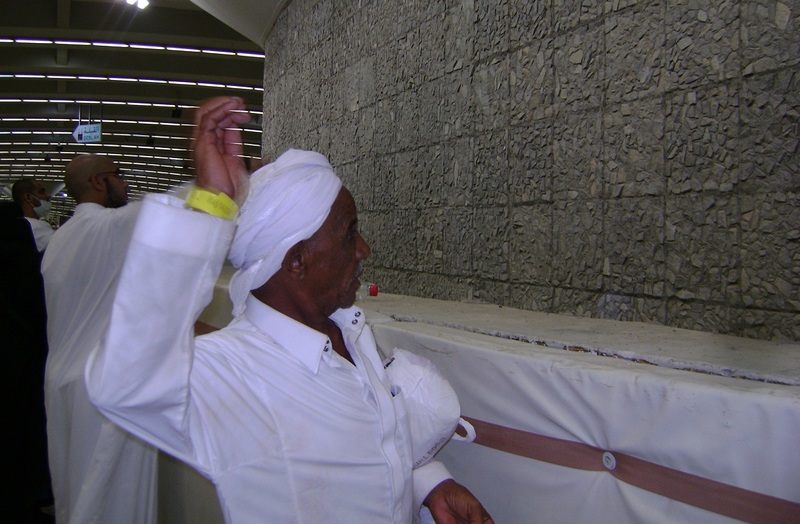 Abdul Rudy and Abdulrahman (background) casts their stones at one of the three symbolic pillars at the Jamarat where it is believed the prophet Abraham was tempted by Satan. In this way Abdulrahman and Abdul Rudy testify that they choose to submit to God, denying the temptations of Satan and this world. The Hajj is the fifth of the “Five Pillars of Islam”. All Muslims who are financially and physically able to perform Hajj are obligated to make the pilgrimage to Mecca at least once during their lifetime. Millions of poor Muslims from around the world scrape together all their lives the thousands of dollars needed to do the Hajj. During the month of the annual Muslim Hajj, the city of Mecca receives as many as five million pilgrims. Various organizations dedicated to organizing and managing the Hajj, such as the Hajj Commission of Saudi Arabia, have been forced to reluctantly institute a system of registrations, passports, and travel visas to control the flow of the great numbers of pilgrims. This system is designed to encourage and accommodate first-time visitors to Mecca, while imposing restrictions upon those who embark upon the trip multiple times. The registration system has prompted outcries of protest among some pilgrims who have the wherewithal to make the Hajj on multiple occasions, but the Hajj Commission has stated that they have no alternative to prevent tragic accidents. Pilgrims who complete the Hajj consider it one of the greatest spiritual experiences of their lives. The Hajj is seen in many cultures as one of the great achievements of civilization, because it brings together as much as one-fifth of the people of the entire world and focuses them upon a single goal: the difficult task of completing the Hajj. This is an achievement unparalleled in human history, and philosophers have said that only war can compare to the Hajj in terms of organization and scale. 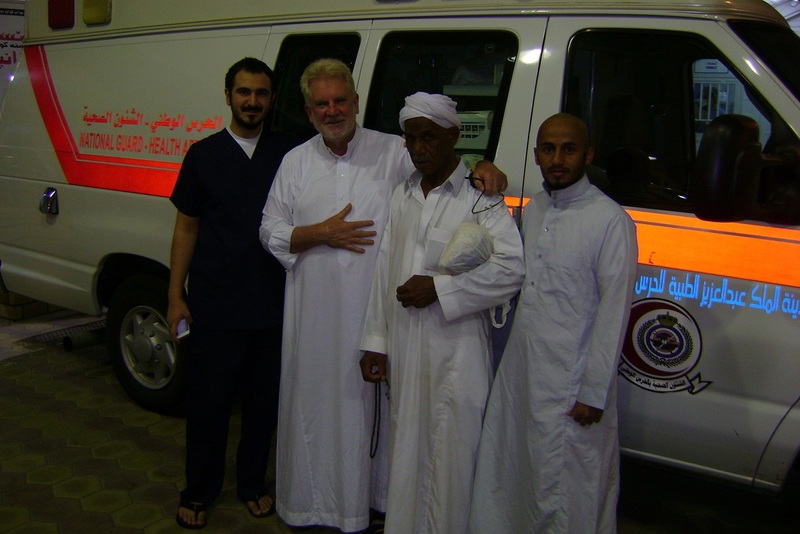 Abdul Rudy and Sam with healthcare workers at the Saudi National Guard pilgrims’ clinic. Abdulrahman, Abdul Rudy and I were fortunate to be invited to camp with a Saudi National Guard/Red Crescent Hajj healthcare facility in the Mina. Abdulrahman’s father, a cardiologist, was chief physician at the clinic. Our camp was in the middle of all the Hajj happenings. Everyone welcomed me and treated me with great respect and honor. In all, the three of us walked nonstop more than 25 miles—once all the way from Arafat to Muzdalifa and then on to the Kaaba in Mecca, about 13 miles! My feet were bleeding and blistered, and every joint in my legs and feet were swollen and in pain. It has taken me several days to recuperate from the strenuous ordeal. I don’t know how much weight I lost in four days, but it was significant. I feel closer to God because of what I have learned. My faith, a gift from God, is more precious to me than ever before. “It is understandable that there will be a lot of trash created as a result of the congregation of around three million people. What is not acceptable is how Muslims, whose part of faith is cleanliness, litter and sully their holy sites. The usage of tons and tons of plastic and other disposable utensils is the main culprit behind the accumulation of so much trash in the sacred sites. “It is sad how we ignore the fact that Hajj is supposed to be an opportunity for us to live simpler lives where we respect the environment around us. 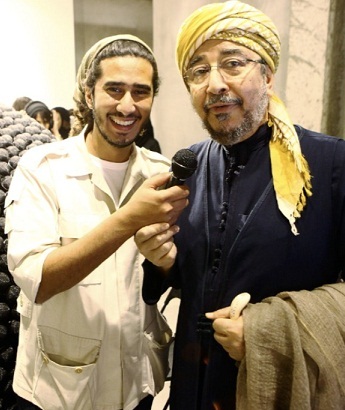 Architect and historic preservationist Dr. Sami Engawi with his son Ahmad. Dr. Sami Engawi, a world-renowned architect and historic preservationist, is concerned about the over-development of Mecca as many Muslims seek to cash in on profits during the annual Hajj season. Engawi who heads the Amar International Center For Architectural Heritage, wants to preserve Islamic culture by means of saving historic buildings in Mecca and Medina, the two holiest cities to Islam. In an interview with the BBC, Engawi speaks about the importance of preserving Mecca’s historic buildings and heritage. I was exhausted towards the end, once collapsing on the sidewalk, unable to muster the strength to walk another step. These two men will always be known to me as my “Hajj brothers.” They didn’t give up on this woefully out-of-shape, 64-year-old American man. Towards the end of the Hajj a delegation of Indonesian pilgrims gathers around Sam in Muzdalifa for a celebratory group photo. I had only three days to study about Hajj before our departure. Abdulrahman had given me a book to read. I did my best to understand where I was going and what I would be doing. But, in the end, there was so much that happened in these few days that I still did not fully understand all that was going on around me. I learned as I followed Abdulrahman and Abdul Rudy through the rituals. I’m still reading even as I write this blog post—trying to figure out what was said in the Arabic prayers that were uttered constantly before, during the five-day event and at the end. Let me end by stressing again that Hajj was an extremely difficult experience, not just for me, but for the millions of Muslims I met along the way. People did the Hajj with all their hearts, many suffering from physical difficulties of all kinds–most of all ailing joints! The Saudi government did a remarkable job of controlling and assisting the crowds. The Saudi National Guard healthcare workers were remarkable in caring for pilgrims with health problems of all kinds. And Saudi citizens did an incredible job of passing out free food and water and safeguarding foreigners. One very important thing I learned from the many foreigners I met along the route was that regardless of international politics, they haven’t lost their love and respect for Americans. Just about all of them have some relative living somewhere in the US. When it was pointed out that I was an American, people gathered around me for photos. 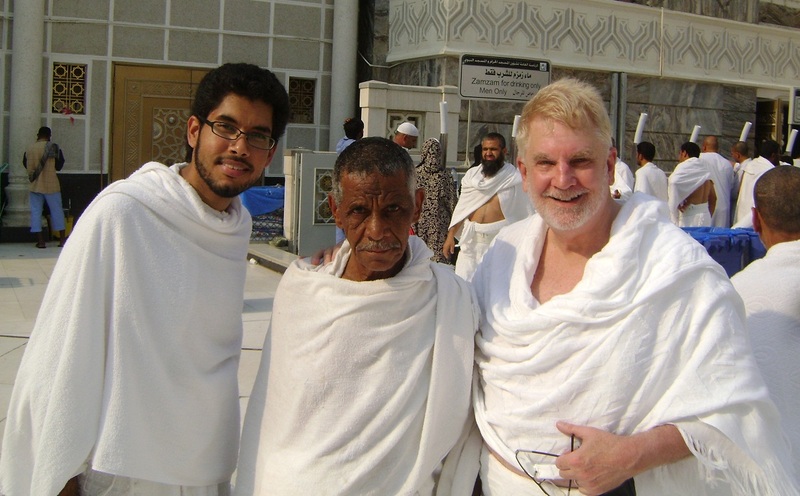 They were grateful that an American would seek to understand Islam and make the Hajj along with them. So I ask my Jewish, Christian and Muslim brothers and sisters in America: Do you realize just how respected and loved by Muslims around the world you are? In each of our Abrahamic faiths, Judaism, Christianity and Islam, we have our small minority of “crazies”; extremists who make the evening news because of their hate, bombing and killing. They cause a lot of misunderstanding. But they are few in numbers compared to the overwhelming many who love the God of Abraham and seek peace, freedom and justice in the world. As all the holy books teach, true justice is about compassion and harmony. It is not about revenge, which is selfish demanding that one get even for past wrongs. May we all walk together in unity, seeking to make life better for all the world’s peoples. May the next generation of Jews, Christians and Muslims become a voice and force for compassion and understanding as we submit to the God we all claim to love and serve. May we rebuild our cities and nations with justice, religious tolerance and economic opportunity for all men, women and children. This is not a “suggestion” from God. It is our duty and obligation as we submit to God’s will and direction in our lives. Let’s keep standing, keep hoping, and keep working in God’s cause!